This level has medium difficulty. 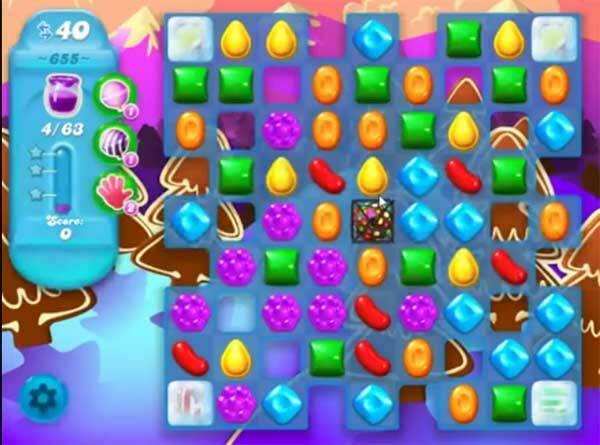 For this level try to use colorbomb or other special candy with other special candy to break more candies to move bear. Or take help from the video below to take bear to the top. The goal of this level is to spread jam, NOT get a bear above a candy string. This level is impossible.. Board keeps juggling when there are moves to make… Candy crush… Stop cheating…. This level has EXTRA HARD DIFFICULTY not medium !!! If I have an employee who presents a game like that, I dismiss it to the instant.This is the anti game.Is more enterteining to return to the work that this. Before this already they were proving to be decided for doing that you pay them for playing.Because of it they torture it with stages as this one in order that you decide to pay to continue forward.Shameful. This level does not depend on skill. It depends almost purely on luck. It’s the reason I have almost made up my mind to ditch the game which is a pity as I usually enjoy it. Ditto. I hope the creators of this game get squashed like a bug in the karma backlash. Ridiculous level. Takes the pleasure out of playing. my version of this level does not look anything like this version, the whole top row is solid white blocks the bottom row is the same and the sides are regular blocks. impossible to figure this level out, used 2 choc. donuts nothing, numerous other combinations and nothing. Been stuck on this level now for weeks, used to do a couple of levels a day. Now I’ve lost all interest, as it’s totally impossible!! Guys, try out t://sodabooster.com/ Everybody is using free gold bars for Candy Crush Soda Saga from here!